Desert Pl. Life 22: 17. 1950 ; cf. Gray Herb. Card Cat. 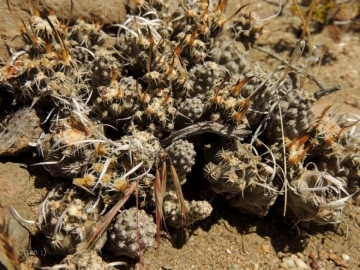 Habitat: Grows on rocky hillsides. 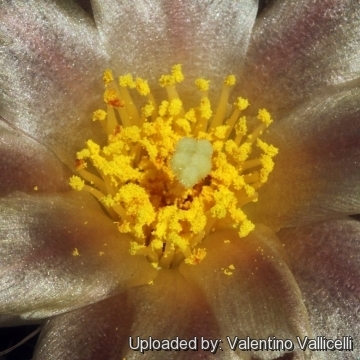 Pterocactus australis var. arnoldianus Backeb. 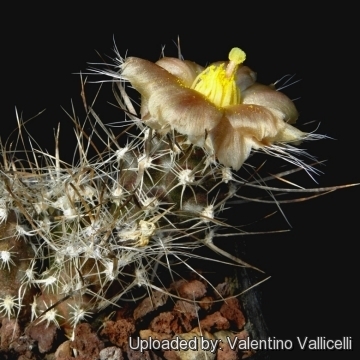 Pterocactus valentinii var. arnoldianus Backeb. 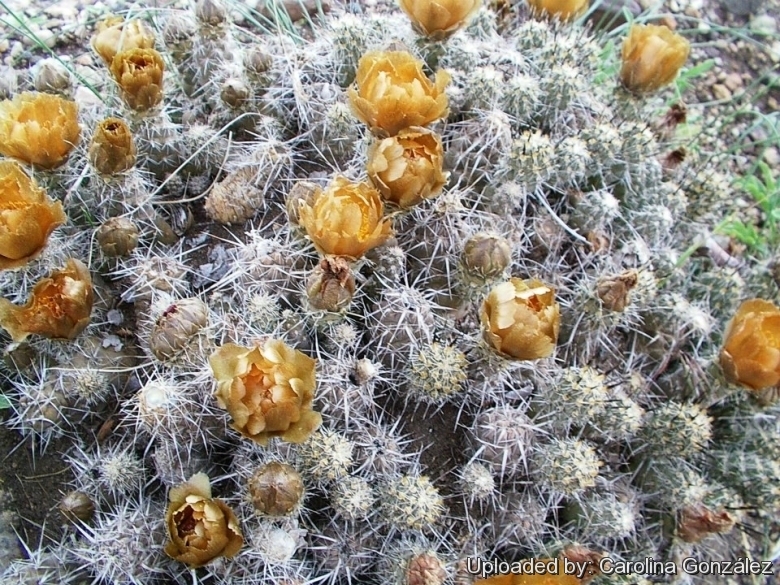 Leaves: The leaves on all Pterocactus are small and fall away early. 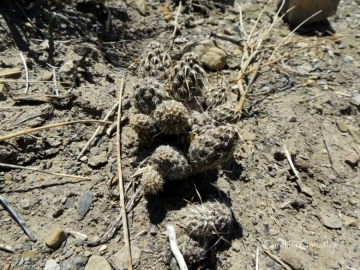 Central spines: 1 to 2 upward, 2 (or more) cm long, whitish to brown or black and more or less flattened and papery, present only at the growing tips. Radial spines: 10-15 white 3 to 4 mm long. 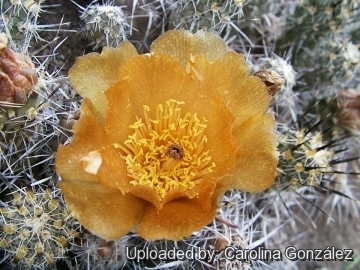 Flowers: Diurnal, solitary, perianth funnel-shaped, 2-3 cm in diameter, tepals brownish- yellow with a pink hue and a silky sheen, the color of the stigma is variable. 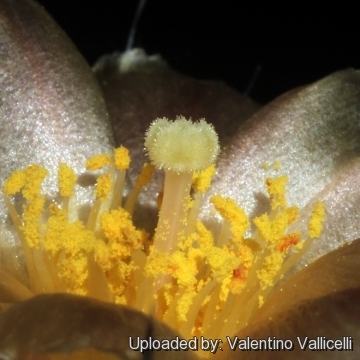 The flower originate embedded at the end of a segment tip and the floral tube is indistinguishable from the stem itsef.Often the old flower bud does not distinguish from a sterile shoot in the upper part. Fruit: Dry, dehiscing transversely near the top. Covered with areoles, which fall off at maturity. Seeds: Winged, seeds typical of the genus. 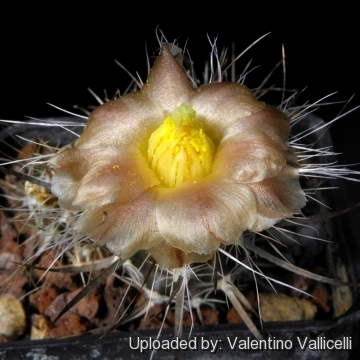 Notes: The spines in the new shoot of P. australis have the tendency to point upwards while those of Pterocactus fischeri usually point downwards. 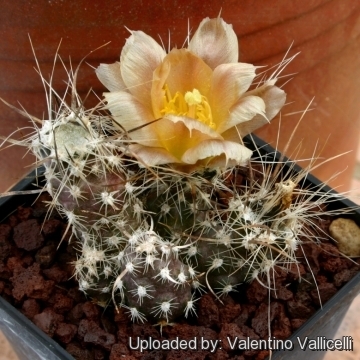 Cultivation and Propagation: Pterocactus australis is easy to grow, provided it is kept cool, but dry during autumn and winter. It is a particular favourite of caudiciform plant enthusiasts.